Why does it take me so long to write my books? Well, for one, I get lost down rabbit holes. Here’s what happens: I come to a part in a chapter where I need to gather a bit more information on a particular aspect of a breed, region of the world, or of a particular period in history. So I open a book, or go online to see what I can find. But more often than not, despite my best efforts to spend no more than an hour or two looking for what I need, I end up going down some obscure rabbit hole that occupies me for the next week. Case in point: wondering how and why the first Korthals Griffon registered in America was called a “Russian Setter”. Instead of doing a quick online search and then a bit of creative cutting and pasting from an article I already wrote on the topic, I ended up spending the better part of a ten days neck deep in back-issues of newspapers published in the 1880s. And in the end, I never did find out exactly why the dog was registered as a Russian Setter. 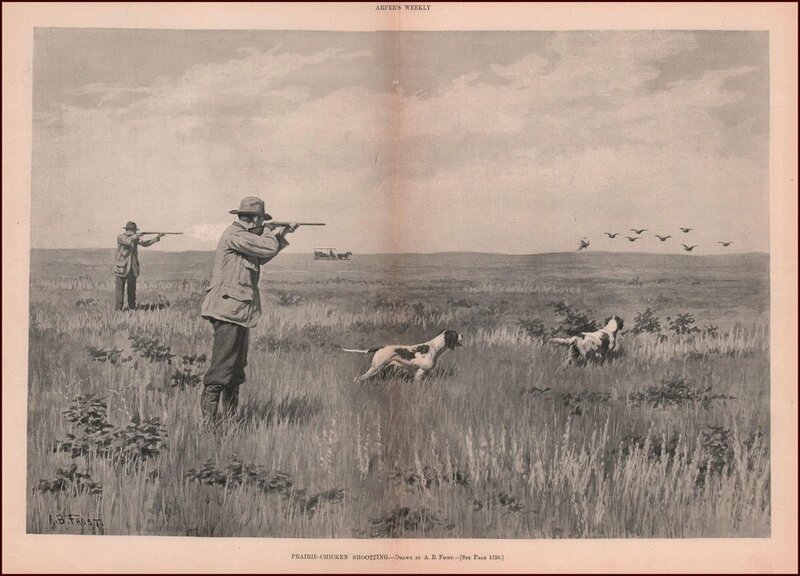 Instead, I found article after article about the early days of setters and Pointers in the US, including an extraordinary piece about hunting prairie chickens over Russian Setters in Nebraska in 1885. The article is far too long to include in my next book — I will probably only us a line or two from it— but the article is just too interesting to not share with others. So what is a writer prone to rabbit-holes to do with the excess of super cool stuff he digs up along the way? Post it to his blog! So here it is. Part One of what I hope will become a long-running series of all the cool stuff that will never make it to the book, but that I can’t resist sharing with other dog geeks like me. “Shots Among the Prairie Chickens” first appeared in the January 29, 1886 issue of Forest and Stream magazine. 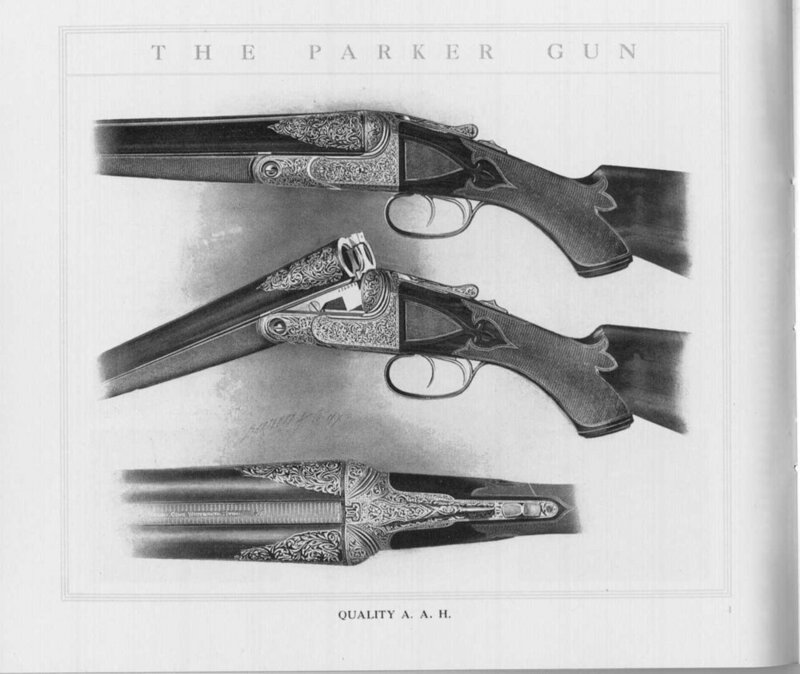 In it, the author mentions, almost in passing, that in the hotel where he was staying there was “a Parker gun behind the desk and two Russian setter dogs under the table”. It is the earliest reference I have yet to find of Russian setters hunting in America and it is a fascinating look at a bygone era of upland hunting on the plains. I hope you enjoy it as much as I did. English, Irish and Russian Setters. The Russian Setter is the one in the back. SHOTS AMONG THE PRAIRIE CHICKENS. Having little time and less money to spare last fall, but being—as usual—possessed of a very large desire to look at something over my gun barrels, fortune favored me one day late in September on meeting a friend who said: "I understand you have been out chicken shooting" I had been up north about eighty miles, where, I was told, I could find a few birds, and I found them few indeed—I tramped for three days—got up a flock of six and divided even with them, taking three for my part, and came home. "Yes," I said; I have been out, but found few birds and no sport." "Well," he answered, "now I want you should lay out a trip and go with me." I told him I could hardly stand another trip. "But," said he, "this is my trip. You will go with me, will you not?" You would be almost surprised to know how little urging it required to induce me to say yes. As my friend had recently been presented with a fine Irish setter but had no gun, he insisted I should go with him and select an outfit, which we at once proceeded to do and accomplished satisfactory. After making what inquiries I could for several days I nearly satisfied myself that all localities within a few hundred miles had been shot over. As this was toward the last of the month and the law was off on the first, if we decided to hunt within a radius of four or five hundred miles we should be obliged to glean the fields where others had reaped the harvest; so we decided to start for Nebraska, hoping to get beyond the market hunters, especially those who had hunted for this market, for the woods are full of them all over the West, and they are wiping out the game of all kinds as effectually as a fire licks up the prairie grass. We bought tickets to Omaha, with a privilege of a rebate if we decided to stop anywhere this side; but after diligent inquiry at every possible point and opportunity we traveled across the States of Illinois and Iowa from east to west, receiving but the one answer, "The birds have been about all shot off." Now this looks a little sad, that in two States, where but a very few years ago chickens enough could be found almost anywhere to make excellent sport, one should be told that the first month of the shooting season is over, that "the birds have been about all shot off." It only reveals the truth that our game of all kinds is being rapidly and surely exterminated. I am aware that in the Great West everything is done on the "broad gauge" plan, and that a majority of sportsmen here think they must have a "pile" of game in order to get any sport out of it; but they will very soon have to moderate their desires and learn to get more sport out of less game. We arrived at Omaha in the evening, and stopping overnight were told that a great many chickens had been shot about 100 miles west on the U. P. R. R. We told our informant that we were not after chickens that had been shot, in fact we were not in the second-hand business at all, but had started for some locality where we could "sit down at the first table." The next morning we took cars and after riding about eighty miles in a northwest direction were landed at the little town of Bancroft on the edge of the Omaha Indian reservation. A few moments' conversation with the landlord, a Parker gun behind the desk and two Russian setter dogs under the table, satisfied me that we had made no mistake in our location. I being the commissary of the party, was ordered to make arrangements for our supplies during our stay, which I did by saying we should want a team at our disposal which would stand fire, enough to eat and a good bed to sleep on at night. "How long do you propose to stay?" asked the landlord. Our answer was: 'Until we get satisfied." The price was named and that settled it. About this time we were called to dinner, where we were seated at a little round table with plates for four, two of which were already occupied by a middle-aged gentleman and a young lady. Do I bear someone ask, What has all this got to do with chicken shooting? Don't be in a hurry, young man; go slow and I will tell you all about it. After dinner my friend in looking at the hotel register, read the names immediately above ours: Mr. S—— and daughter. As the aforesaid daughter was standing near him while Mr. S had gone to order up his team preparatory to starting, my friend with all due apologies inquired of the young lady if Mr. S was a native of the town of M, State of Connecticut, and being answered affirmatively, my friend said: "Will you please tell him an old schoolmate would like to speak with him before he leaves?" Such is life; here were two men, past the meridian of life, who had never met or even heard of each other since the old brown door of an obscure Connecticut schoolhouse had closed behind them. One had served his country as a soldier through the civil war and bore the scars of battle and both in mercantile pursuits had wandered west to meet here by the merest chance for the first time since they were boys together. It is sufficient for this narrative to say that Mr. S—— ordered his team returned to the stable, and he and his fair daughter did not leave us until we had finished our week's sport, adding very much to our enjoyment. Prairie chicken shooting is par excellence the sport of the lazy man; it is the easiest of all land shooting—first, because the field is always open, and if one is too lazy to walk he can shoot from a horse or wagon; second, because early in the season, before the birds are quite matured, or have been too often disturbed, they will lie in the tall grass as close and long as one wishes; and thirdly, because they make a good big mark, flying true and not too rapidly, and there is so much of them that one need not fear of blowing them all to pieces, leaving nothing but feathers in the air. If they happen to get up too near for a shot, you can measure your distance, knowing there is no bush or tree for them to dodge behind. Thus in all respects, they make fine game for one not disposed to be in a hurry; and for these same reasons the gentle things are easy plunder for the unscrupulous market-hunter. Later in the season (or at the time we were out), during the last of September, the birds are fully matured, have become stronger flyers, and have been made a little more shy from an occasional shot among them, even in this far off locality, and will not always allow a dog to approach so near them; and if a bird gets up twenty-five or thirty yards away one has to wink his eye pretty quick in order to stop him, for being strong they will carry off quite a weight of shot unless winged or hit in a vital part. We shot mostly on the Omaha Indian reservation, which here is quite rolling, but excellent land covered with a heavy growth of prairie grass, and there being no fences we could drive at will in almost any direction. The Indians had here a few fields of corn and other grains, but there were thousands of acres over which we could ride and shoot at pleasure. Our wagon was a comfortable two-seated spring wagon with a park top which would carry four or six persons and our dogs, and we had a couple or ponies somewhat larger than jack rabbits for a team which would walk or run all day, but manifested a most decided disinclination to trot. We had taken two dogs with us, an Irish and English setter and our landlord had two Russian setters which were at our service, so we were pretty well fixed for an enjoyable time. Our mode of proceeding was about this: We would get an early breakfast, load up dogs, guns, ammunition, lunch, a big jug of water for ourselves and the dogs; thus equipped our party of four, as reorganized, would point the ponies (which my friend named Splinters and Shanks) for the Indian reservation, when a ride of a little more than a mile would bring us on to good shooting grounds. We always drove to the leeward of the field over which we designed to shoot. Then we would get out, leaving Miss S to manage the team, following slowly in our wake and occasionally marking birds for us, which services she rendered in an admirable manner, and with a new and delightful pleasure to herself. With the four dogs, the three of us keeping about two hundred yards apart and moving in line as nearly as practicable, each would generally find birds enough for his individual shooting without disturbing the others or placing them in danger; and when one's pockets became too heavy for comfort or convenience, he would fall back to the wagon and deposit his load. Occasionally we would all meet at the wagon, when we would water the dogs, sample our lunch, a cigar, look over our birds, and when we had finished our chat and were thoroughly rested, start out for another tramp. Thus we would put in the time till about 11 o'clock, when it was time to bundle ourselves and dogs into the wagon and drive back to the hotel for dinner, after which came cigars and usually a game of cards till about 3 o'clock, when we would find ourselves again seated in the wagon and on our way for the evening shoot, which usually lasted far into the "twilight soft and grey." To me there is a rare and indescribable delight in shooting on a still, quiet evening, watching the last rays of the setting sun, and the last faint glimmer of light as it quietly passes away under the gauzy curtain of night. (May the last days of all good sportsmen be as quiet and pleasant.) We always found supper awaiting us on our arrival home, when after caring for the dogs and shedding our hunting traps, and taking a good square tin pan bath, we, "us four and no more," would gather about the little round table aforesaid, doing ample justice to broiled chickens, flanked by vegetables, warm biscuit, pastry, etc. After supper we would look to the comfort of the dogs, and then seat ourselves for a cheerful chat and game of cards till bedtime. Should you ask me now how many birds we bagged, I could not tell; I kept tally till we got past 100 and then quit. We did not forget our friends nor neglect ourselves, for we sent away a box each day, and kept a string hanging under the little porch of the hotel from which our table was supplied at each meal. Thus we passed the week, changing our route occasionally, always getting birds enough to make it enjoyable sport, never turning it into downright slaughter, and leaving birds "enough and to spare." And with it all we had a good time. Forest and Stream, January 29, 1886.